How HubSpot, IMPACT Branding and others have generated more leads by updating existing blog content. Marketers constantly feel pressure to create something new. We feel like we always need to produce something new to feed the email list, the social channels, or the potential for lead generation. This pressure to drive monthly results and be creative at the same time is unnecessary. Why? Most of your traffic will come from previously published content anyways! How? If you have been blogging consistently for over a year, you probably have a library of content that attracts a majority of your traffic. Even though new posts and campaigns usually attract a minority of a website’s visitors, marketers often focus the majority of their time producing new content. While you’ll need to create new content for future optimization efforts, historical blog post optimization is often a missed opportunity and low-hanging fruit. So, how do you do it? Historical optimization starts with a strategic review of your top-performing blog content. A top-performing blog post usually has at least one of these two characteristics: it receives a lot of traffic, or it does a great job of converting visitors into leads. Historical optimization turns high traffic blog posts into large lead generators by improving the conversion rate of them; and high-converting blog posts into high traffic posts by increasing the traffic to them. Net-net, both approaches ultimately help you generate more leads. Taken together, they are low-risk, high-reward ways to drive more leads quickly. Not convinced? When Pamela Vaughn at HubSpot undertook this historical optimization process, they doubled monthly lead volume. Think about that for a second. These posts were already in existence; they didn’t need to be written from scratch, and yet, they became a solid source of new leads with just a few tweaks. First, find a list of blog posts that get a lot of traffic, but don’t generate a lot of leads. If you’re using Google Analytics and have properly setup Goal tracking, you can look at the posts (e.g. landing pages in Google Analytics) with the highest traffic, but a low number of goal completions. 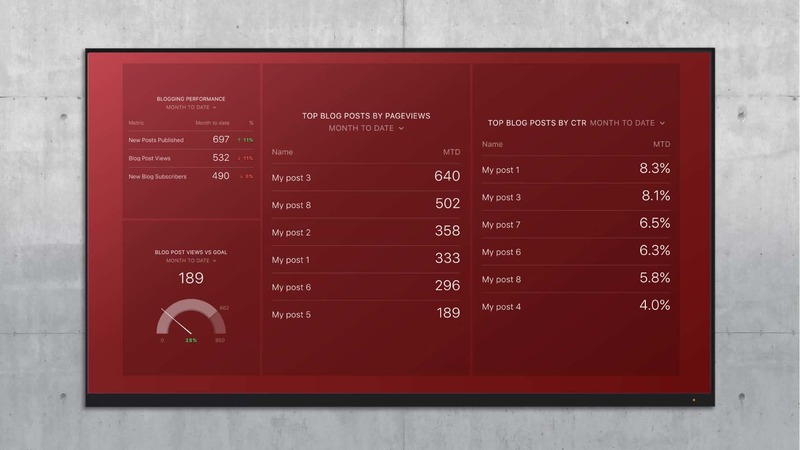 If you’re using HubSpot for your blog and to place Calls to Action buttons in your posts, you can see which posts convert at a high rate with this dashboard. Once you find a few posts to conversion-rate optimize, take a look at the sources of traffic. If you’re getting a lot of traffic from search, you might want to use SEMRush or HubSpot’s keyword tool to identify the keywords people are using to find it. Once you do, make sure the keywords match up with the call to action (CTA). The CTA must line up with the top keywords people are keying into Google before arriving at the page. To quickly get more leads, find a list of blog posts that convert visitors to leads at a high rate already and increase traffic to them. If you’re a HubSpot customer, you can use the same dashboard above to find these posts. To get the biggest bang for your effort, begin by historically optimizing the posts in the rough order of popularity of their initial version. By starting with the most popular ones, you’re ensuring your first few experiments will be successful. Once you re-publish posts with better CTAs or with more and updated content, share them on social, email them to your subscribers and build more links to them. You shouldn’t necessarily re-share something you did last week, no. But if you update a post from months or years ago using the steps above, you can re-share via email and social channels. And you can certainly write a guest post or two to build links to it from other sites. Afraid you’ll upset your audience by re-posting something? Don’t be. Your current followers may not have seen this content. And, even if they did, your update may warrant a fresh look at it. If you want to be upfront when promoting it via email, you could even remind them “Hey, you saw this a few months ago — but we updated the material!” After all, you just put in the work to make it more relevant to them. Companies and agencies feel the urge to create new, brilliant content and respond to what’s happening in their vertical. Look — still do that, yes. But do you have to do it every day? No. This historical optimization strategy is relatively fast and easy, and all the data you need to predictably increase traffic and lead volume is readily available. Further, these posts have a much greater chance of being popular on email or social than a completely new post, since it’s previous success is likely to be an indicator of continued relevance. Like curated content, the audience for these historically-optimized posts is already validated.